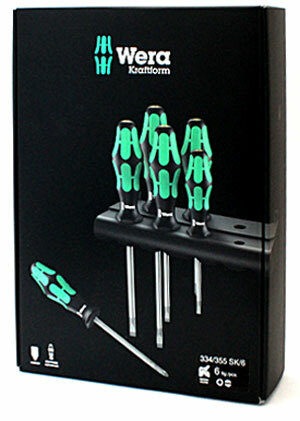 The Kraftform handles with soft and hard zones allow for easy work with less fatigue of the hands. A stopper prevents unintentional rolling. 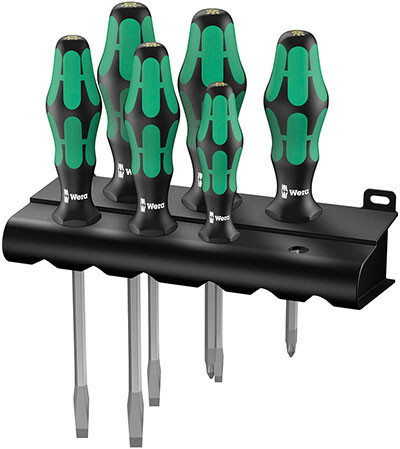 The screwdrivers feature clearly marked sizes and the type of tip on the back of the handle for easy selection. The micro-rough tip will grab onto the screw head, preventing involuntary slipping and damaging the work piece. WERA screwdrivers come with a rack that can be fastened to the wall for organized storage and quick access.